Workscape’s free trial includes full access to the Workscape Basic Plan for 14 days. Please note that for the free trial, your office must use your own iPads or existing displays to use the meeting room display app for booking. Three days before your trial expires you will receive a reminder email. If your credit card information is valid you will be charged on the day your free trial expires and receive an invoice. If your credit card info is not valid, you will no longer have access to the Workscape meeting room booking system. Your billing information can be found under the Billing tab in the Workscape Admin Dashboard. 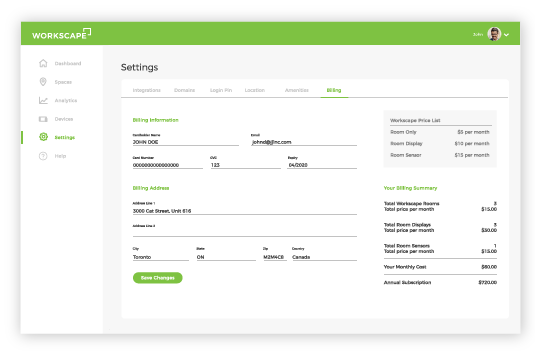 From this tab you can view your current subscription pricing, update your billing information, and see your next billing date. Your credit card will be charged annually based on your plan and number of bookable rooms. Workscape’s free trial includes full access to the the Workscape Basic Plan for 14 days. Your billing information can be found under the Billing tab in the Workscape Admin Dashboard. 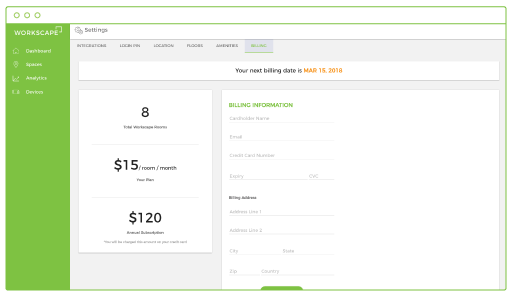 From this tab you can view your current subscription pricing, update your billing information, and see your next billing date. Your credit card will be charged annually based on your number of rooms, room displays, and sensors on your Workscape subscription. For example, if you have 5 rooms and all 5 have rooms displays, but only 2 have sensors, your monthly subscription would by $105, and your annual subscription price would be $1260.